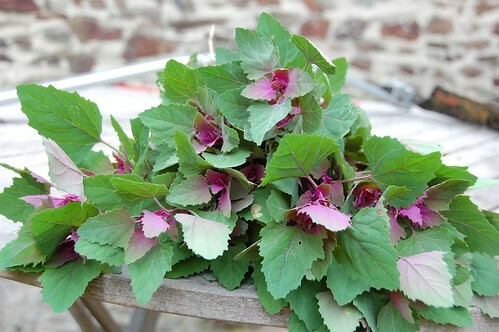 Bouquet of Magentaspreen, the tree spinach. Other people have blogversaries, I have the anniversary of when we first made our decision to buy this place. Happy 5th Year completed! It's been rather a pared down season, oddly as the weather has been so dramatically hot. Apart from the usual overdose of courgettes and magentaspreen nothing much is showing any signs of being ready to harvest. Even the potatoes are much later than usual. We've had a few of the Stroma but today I took the first sensible handful of the International Kidney which have been growing strongly but more slowly than either the Stroma or the Mayan Queen. They are delicious, so well worth the wait. I was beginning to wonder if I'd ever taste a really good potato again and also if all the hype about 'Jersey Royals' was just that but I needn't have worried. Talking of the Mayan Queen it is a bit confusing. I ordered Mayan Gold from Alan Romans but the bag of seed tubers I received were labelled Mayan Queen. Looking at the descriptions of Mayan Queen though, the potatoes I've dug so far don't match. They look like Mayan Gold! So I don't know what to make of it, I'll have to order both next year and do comparisons. In the box, some welsh onions. I grew these from seed last year and they didn't do terribly well then but this year they're very pleasing, coming well through the icy winter, bulking up vigorously and providing an easy alternative to spring onions (or scallions if you prefer). Just right for me as I can take a few at a time as needed without having to worry about successional sowing or everything maturing at once. 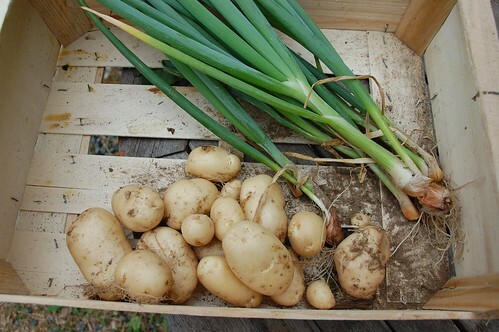 The seed came from Real Seeds, Helen's Welsh Siberian Perennial Bunching Onion and is recommended.